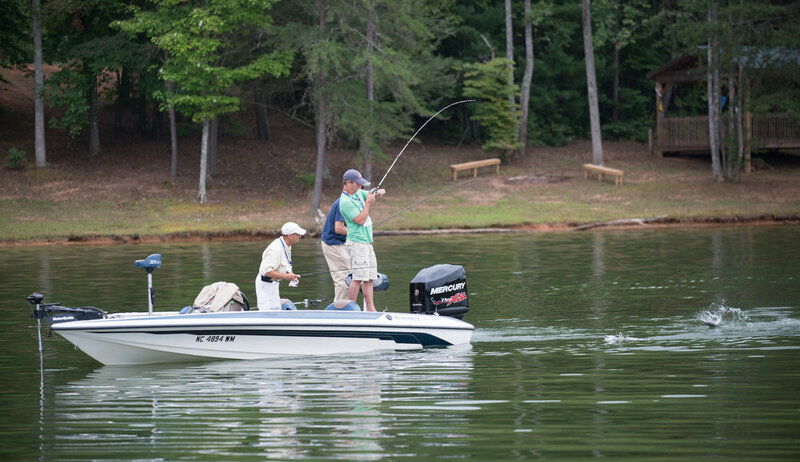 Twenty anglers caught over 200 fish during the 2015 Hooked On Camp Fishing Derby held Sept. 10-11 on YMCA Camp Harrison’s Lake Broyhill. The annual fundraiser generated more than $23,000 for the Camp Blue Skies Foundation. Returning again this year as the Derby Sponsor was Dynamic Health & Pain Management of Charlotte. Curtis Johnson of Charlotte served as our Largemouth Bass Sponsor and REDLINE Design Group served as our Bluegill Sponsor. Most participants arrived Thursday evening and enjoyed a hearty dinner followed by fellowship and football viewing. Early Friday morning over breakfast, Derby Captain Gene Vaughn went over guidelines and safety practices. John Wendel, NBC Charlotte meteorologist, provided the weather report. Anglers were paired with guides and the derby was off. It was a glorious day for fishing and celebration of Camp Blue Skies! Biggest Bass 2015 Hooked On Camp Fishing Derby. Biggest Bluegill Camp 2015 Hooked On Camp Fishing Derby. Save the Date! The 2016 Hooked On Camp Fishing Derby will return to YMCA Camp Harrison! Date to be announced soon. To reserve your boat now or become a sponsor, email Leighann@CampBlueSkies.Org.